Box and all original contents are all in very good condition. Comes with map and pouch of runes. Own this classic now! A true leader of the pack, Ultima Underworld used a fully 3D first-person perspective a full year before Wolfenstein 3D hit store shelves. Not only was it impressive visually for the time, but it was introduced some neat gameplay elements into the action-RPG arena, such as altering the speed and power of attacks by direct control and introducing 3D puzzle elements. 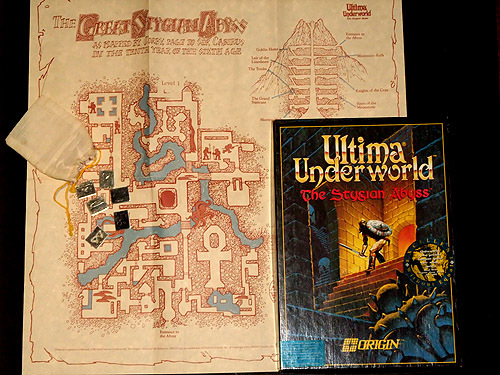 Ultima Underworld was an amazingly rich title that showed the world that first-person engines were capable of a lot more than simple shoot-em-ups before there were even any 3D shooters. Hi, I am interested if its complete with all manuals and disks as well? Or does it only have whats in your picture? � Teenagers of the underworld � V2.